This is part 2 of a 4 part series. Start here with part 1, part 3 (the how), and part 4 (the conclusion) to get the full picture of how to integrate this meal planning guide into your normal routine! part series on Meal Planning. Start here! This was Stevie’s brainchild. I can’t take credit, which kinda makes me mad. I think he was just tired of me asking what he wanted for dinner. He said it so matter of fact. Like the logical man that he is. Blimey genius. I wasn’t sure if I wanted to smack him or smooch him. How long had he been holding this golden information? And why does my creative, free-flowing, glitter-lined brain not think of it? But I finally got around to giving it a try and I think I’m in love. I hope to have a year’s worth of meals planned within a couple of months. I use Google Calendar (because I like using it better than iCal for this) and then sync in to my iPhone. I’ll give you all the details for how I do it but you could use any system you like. I’m gonna tell you every step—– so at some point, you’re gonna hate me and say, “I’m not an idiot.” I know you’re not. You’re smart and beautiful and I don’t mean to demean you by writing a tutorial that a 1st grader might scoff at. But I’m writing, not you:) And I like hand-holding tutorials. So, take my hand, dear friend, and I’ll walk you through every painful step. Sign into Google and find the Calendar link. 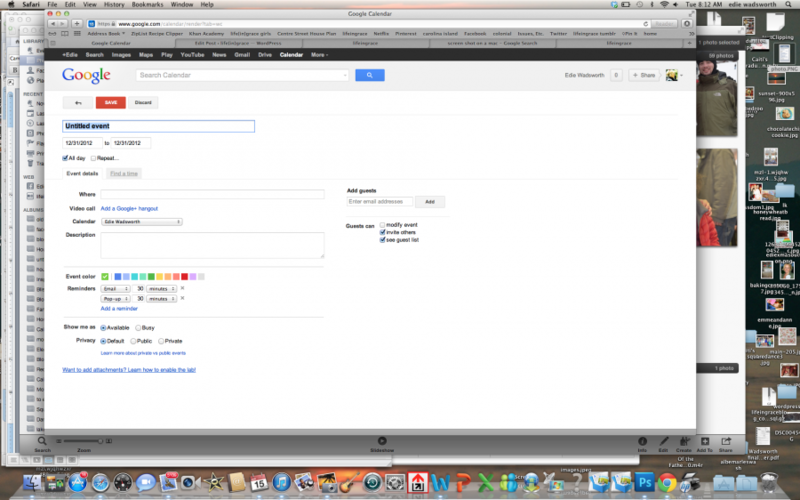 Google is my home page, so for me, the Calendar option is at the top left side of the home page. Once the calendar has loaded, at the top right, click on ‘month’ so you can see the month at a glance. Google allows you to make subcalendars so that you if you want a separate calendar for menu, it’s easy to do. Then, if you want to see all your calendars together, you just click them. The advantage to creating a separate calendar for the menu is that it makes it easy to share and print out, without having everything else that’s on your schedule show up. In this photo, you can see a portion of my calendar when all my calendars are clicked on. And if I want, I can choose just to see my menu calendar, which I don’t have photo of but you get the point. 2. Start adding menu items. I posted some links yesterday to menu options, so we’ll use those as examples. We want to add Greek/Lemon Chicken Soup, so that it looks like this on our calendar. 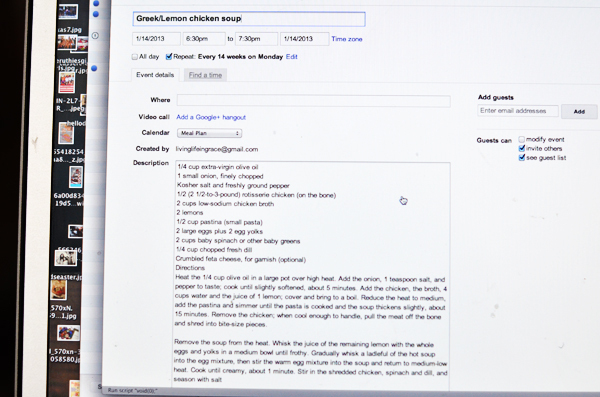 Go ahead and open the link to the recipe (it should open in another window) and we’ll use it to copy and paste portions of it into the calendar. First, click on today’s date on the calendar and this window will open. In the ‘what’ box, put the name of the recipe and then choose which calendar you want it to go into. 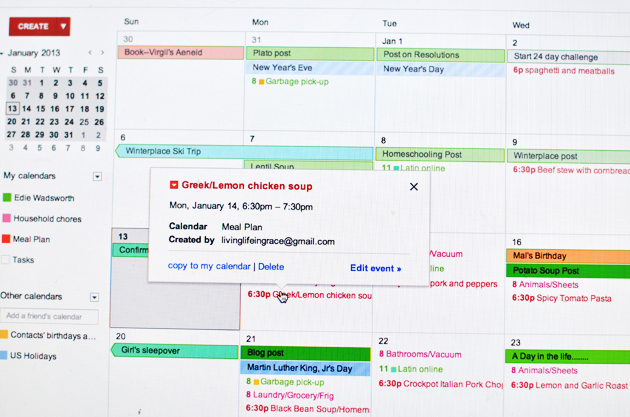 If you didn’t set up a separate meal plan calendar, it’ll just put it onto your master calendar. Then click, ‘edit event’. This will bring you to a page that looks like this. Under ‘Repeat’, choose how often you want the recipe to repeat on your calendar. Every family is different. We like lots of variety so I don’t have my recipes ‘repeat’ very often. But if you had every recipe repeat once per month, then it would only take you one month to have a year’s worth of recipes! I chose 14 weeks for this soup and some things that are seasonal, I might choose yearly or every 6 months. You get the idea. It will take me 3 months or so to get a year’s worth of recipes but then I’ll have my meal plan for the rest of my life if I want—then I just tweak it to add new recipes. Under ‘Description’, you will copy and paste the recipe. For the Greek chicken soup, I just clicked on the link, copy and pasted the ingredients and the directions into this box. You can choose to color code your menu just below the ‘Description’ box under ‘event color’. When you’re done, save it (top left corner) and you’re ready to enter your next item. 3. Sync your Google Calendar with your iPhone. I’m sure there are good tutorials for doing this with other phones but I can only help you with the iPhone. This shouldn’t be as cumbersome as it is but follow along because soon, your recipes and menu plan will be right at your fingertips! Go to the ‘settings’ menu on your phone and then go to ‘Mail, Contacts, Calendar’. Click ‘add Account’ and add your Google account to your phone. Once you’ve added it, it will show up as ‘Gmail’. Tap Gmail and make sure the calendar setting is toggled to ‘on’. Now, go to your computer and sign into your Google account. THen click this link and it will let you choose which calendars you want to sync with your phone. Click the ones you want to sync and then click save in the bottom right corner. 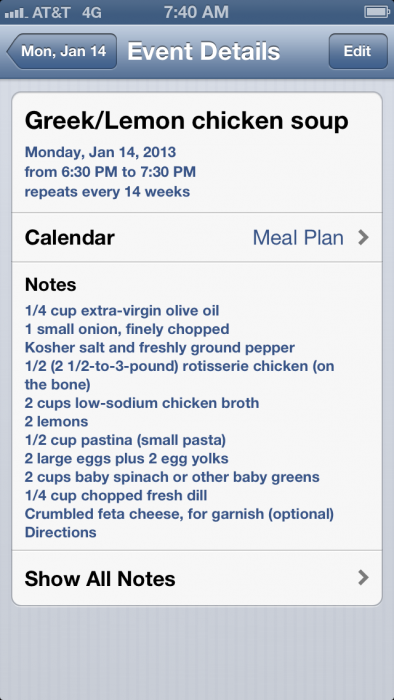 Now open your iCal on your iPhone and you should have the recipe you just added! Here’s the screen shot of my iPhone when I click on today’s date—-see the recipe at the bottom? And here’s what I see when I click on the recipe. Okay, this is all nifty and you’re getting excited about the possibilities, I hope. Tomorrow, I’m gonna show you how to put it all together with my favorite tips and tricks and a program that will help you in your grocery shopping and you’ll be on your way to being the Menu Planning goddess of the world! Let me know how your set up goes and I’ll be in the comments today to answer any questions that come up. While you’re getting it all set-up, let me know if you come up with any other wonderful ideas! You are a genius! I can’t wait until rest time around here to start implementing this! Thank you, thank you, thank you!! This is brilliant Edie! I never thought to use the calendar for this and I can’t wait to try it! Wait! before anything is locked in stone………..go buy Ree Drummonds 2 Cookbooks! Every recipe is family friendly, and I cannot tell you how delicious they are!!!! I have NO affiliation! 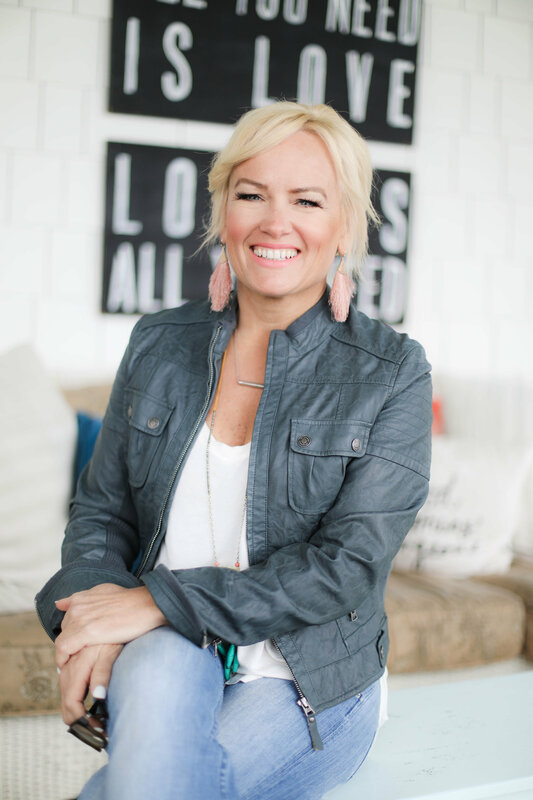 I love her show…..and her blog…….and her cookbooks. My kids also love her recipes! got ’em! love her and all her recipes! just add them to your calendar and set them to repeat! I love hand holding tutorials so this was great for me. Don’t have a smart phone yet but I will definitely be using the Google calendar to start my meal plans. This is an awesome way to plan!!! Yay! I need the hand-holding directions! Can’t wait to do this–and I’m adding some of your wonderful recipes to my stash. Thanks! oh yay! and hand-holding is good! Ah, men. This is a great idea. 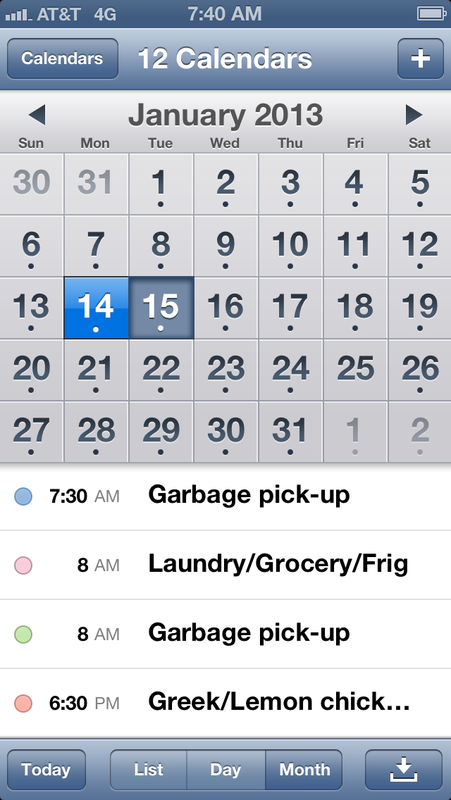 I’ve startedp utting my to do’s in my iPhone calendar as well. Maybe I will do it in google and have that transfer over as well. I like the reminders. Have you ever blogged about your decision to stop working? And yes, Sarah, is right, I work harder now than ever! But I LOVE being home, it’s a dream job to do what I do and I’m so thankful for it. I like detailed tutorials – better to have too much info than too little. And I am already a devoted Google Calendar user. This is wonderful! I’ve added my calendar already and I’m excited to build a repeating menu. Thanks! Oh my goodness! This is the BEST thing ever. Your husband is genious and y’all make the perfect team! I want you to know that this girl needs a first grade tutorial. I like to have my hand held every step of hte way because otherwise I just might chicken out. Thank you Edie and Steve! My January just gets better and better! i’ll tell him you said so, amy! and i’ve always been in love with january!!! I just had an idea. If there was a symbol for the freezeable menus. You can automatically double it and have a frozen dinner. Then on the repeat, eat the frozen entree instead of making another! I always forget what’s in my freezer and I am so busy working and taking care of my kids that I forget . I could even put a reminder on the day of the freezer menus to take the dinner out and put it in the fridge before i leave for work in the morning to thaw out. It is sad how much I use my phone to remind me of things. i’ll have to ponder that but surely there’s a way to do that. if nothing else, put an asterisk by it when you write the name of it in? That is so slick! Thank you so very much! I never would have thought to incorporate technology (duh!) into this job. Linking between google calendar and iCal is perfect. That way I have access all the time and my hubby can use google calendar to start all the crockpot meals we do. (He’s a keeper!) I loved all the hand holding in the tutorial. I needed it. Thanks again!! oh, he IS a keeper, marty! i’m not sure stevie could find the crock pot! thank you so much for holding my hand, i needed it and i now i have everything all set up!! Doh! This is awesome. I never thought to apply a recurring meeting to a recipe. Brilliance! i do too, kristi, because i like to shop all the sales. i’ve been cooking from a huge stockpile of food for two months and just adding to it as i need to. you could still do this i think, with a little more planning! i fit right in at the looney bin! Wow! We already use Google calendar for our family calendar. What an “Aha” moment! yes, the free from stress part, is my favorite! This is probably the single most fantastic idea I’ve ever read on a blog. THANK YOU! I have struggled with both meal planning and house cleaning/maintenance planning/organising FOREVER and this idea/system seems like the answer to my prayers. I am creating Google calendars and organising my life as we speak. Make a recipe recurring, add the recipe to the event – GENIUS…….. GENIUS!! I don’t have an iPhone, not even a smart phone, do you know if this would sync to my Kindle Fire? Then I could have the Kindle in the kitchen to use for the recipe – then no more paperwork required?! Hmm have to check that out. Thanks a million for this, can you tell I’m impressed?!?! oh, i hope it syncs to your kindle fire!! you just made my day, sweet darlin’! i LOVE your enthusiasm and am so thankful for the encouragement! Holy Moly! You just rocked my world! I knew there had to be a way to do something like this, but didn’t have the time to figure it out. The fam just kept getting hungry and I had to feed them, instead of planning what I would feed them! Thanks so much for sharing. Goodness gracious, this is awesome! I have been writing mine out on printed calendar pages forever. This is like – “Welcome to the 21st century! !” LOL! Very glad you wrote out the baby steps – I needed them too. You’re right, it seems so logical but not something any of us thought of. I’m a new follower and greatly appreciate your blog! well, now that you mention it lucy, i’ve thought about this long and hard. thought about doing it for a year and pitching it as a book idea. or formulating it with some great recipes and turning it into a cookbook. 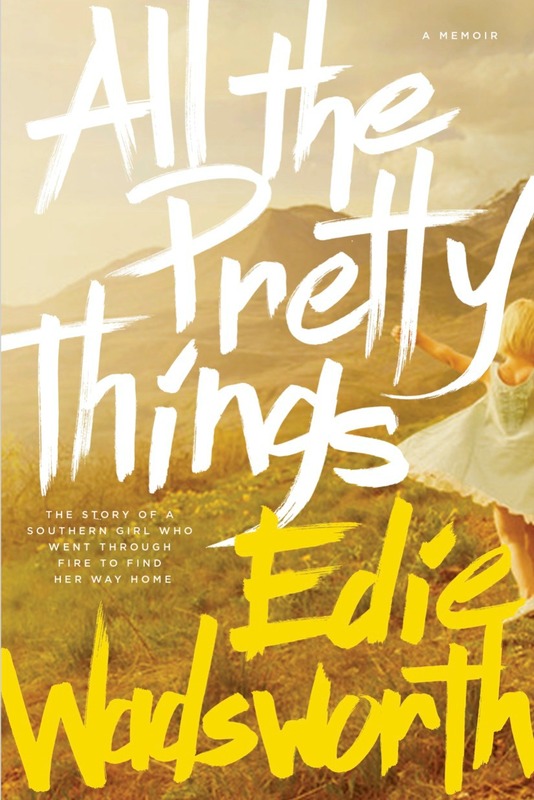 Edie, whether to do it as a book or not….I think the beauty of it is a link where we could access your calendar as you make changes, etc. and have your menus electronically. I would gladly pay you a handsome fee for this kind of help. I am an at home mom (formerly clinical psychologist) with four kids four and under, my boy just broke his leg, my baby won’t sleep through the night, I’m in minneapolis and the high is -8 degrees. Maybe you’d just take pity on me and email me a link for a little winter pick me up! You always brighten my day. I blog to keep looking on the funny side at : threelittlepeppers.wordpress.com. Thanks Sista! Okay, seriously, you and Steve are geniuses. 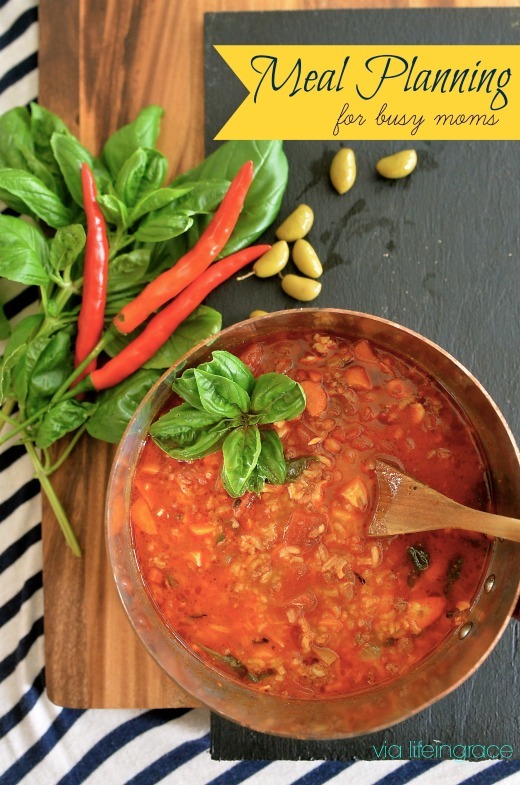 You might like this recipe, I love it! I love your blog, it’s so inspiring. I’m getting ready to home school my oldest daughter who is starting kindie next year. I love the WTM method. Do you have any ideas for curriculum for kindergarten? Thank you! Smarty Pants the both of you are!!!! I have looked on Itunes for various calendars on how to simplify our life and I type on a keyboard a lot faster then I do my Iphone. I didn’t even stop to think about doing a google calendar and syncing it to my Iphone.. Pure Genius keep it coming! Oh my, this is going to revolutionize my world – I hope :-). Thanks Edie – awesome!! why are you so smart? are you my husband in disguise? okay, we’ll deal with this in the series but i don’t have a perfect solution except to say that who doesn’t love options? you can choose which one you cook. OR you can look ahead and pick the one which best suits your family on that day and then delete the other? maybe you have thought about it now and have a better idea though??! When you are repeating, look at HOW to repeat. It asks by day of week or number of month (1st week of…). I think you will have overlapping some though. I hope this helps. B R I L L I A N T ! Edie, will you marry me? I love this almost as much as your blog. Many thanks! yes, i will marry you if the avett brothers will play ‘january wedding’?! I use Google calendar for so much other stuff. I should really think about this. But have you ever seen the Paprika app? It. is. amazing. I’ve had a lot of success with it. It grabs recipes a lot like ziplist does from any website, or manual entry, and you can catalogue the source, rating, catagory of dish (and you can make up your own categories), and it’s easy to email a recipe to anyone with just one click. there’s a meal calendar within the app you can schedule meals and then have all the indregients added to your grocery list, which you can then check off different items if you have them at home or as you buy them. You can email the list, the ipad app will sinc with the iphone app so you have it with you in the store. It’s amazing. And I don’t like to plan the whole year ahead, just cause I like to have the option to tweak things and I don’t know which nights we’ll be travelling or such. It’s not free like ziplist, but SO worth the couple bucks. it sounds awesome too, sarah and i think this series is one of those things that will help people address this issue and figure out their own solution—whether it’s an app or a recurring calendar or whatever works best for them. i’m still a paper girl so i like something i can print out and i’ve used Google calendar before so already so it was easy to tweak. thanks so much for letting us know about this! How about a post sometime on your cleaning calendar too? =) I just moved to a larger house from a very small house – needed more space for 4 boys – and I’m still trying to figure out the best way to organize the cleaning. I can’t do it the same way I used to in the smaller house. Love your meal planning idea. I use iCal, but I don’t have an iphone. Might have to try it anyway though. Are you going to blog about how you work leftovers into your meal plan or how you make those last minute meal changes? THANK YOU! I consider myself fairly organized and am faithful in my meal planning, but I haven’t been using my iphone to its full ability! I normally type my menu out in Word and then I have a grocery list app on my phone that I enter everything into. I love that you can link to the recipe in the notes section of the calendar. I’m looking forward to tomorrow’s post and more info about Ziplist, too! This menu planning series is so helpful to so many people, especially young mothers. I see them struggle a lot over what to make for dinner. Your opening paragraphs yesterday were right on. Thank you so much for doing this for all of us. I also like “Pepperplate”, which is a free app and can also be accessed at http://www.pepperplate.com which gives you calendar, menu planning, shopping lists from recipes, etc. You can also download recipes from many, many sites with the click of a button. I prefer it over a Google based recipe calendar. i’ll be posting soon about how i put it all together but it’s so individual that folks will have to figure out what works best for them. i like google because i can have all my calendars in one place. You married a genius! Why have a never thought of this? Thank you for showing me the tutorial on making a separate calendar. I never knew! Adding my recipes to my “meal planning” calendar now! Bless you and your many soup recipes! I never thought of adding meals as an event to my calendar! Question – how do you handle recipes that you don’t want to add as an event – like sides, desserts, appetizers? great question, carolyn. you people are so blimey smart. i haven’t been putting them in but you could add them into the ‘description’ part of the event or under ‘notes’. i’ll think about that some more and let you know what i come up with! This is GENIUS! 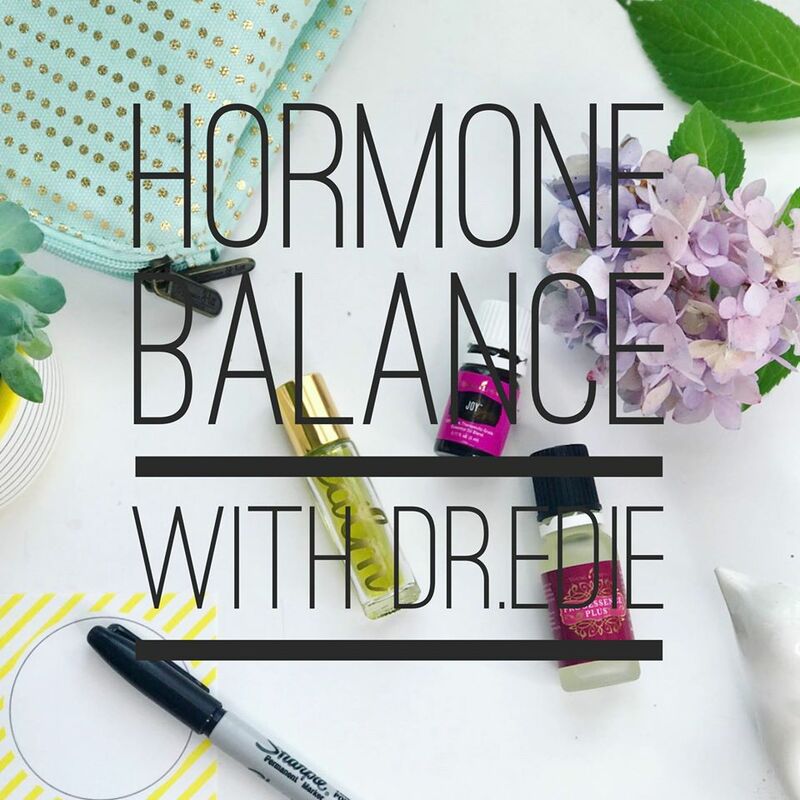 I am also a homeschooling mom of 2 girls…if I can get this going I think this will revolutionize my life!!! I love your blog and all your advice…and your love for the Lord!!! Thanks! wow,, thanks Edie — i got the calendar all set up and cant wait to add menus to it. I sure hope this will help when I go the grocery store and my brain goes dead and cant think of anything to cook. For some reason the description i type in on the computer isnt showing up when I pull it up on my mobile. ?? Thank you! Thank you! Thank you! I just set this all up! My husband is going to be so impressed that I know how to work my calendar and my phone…and he will be super excited that it helps me menu plan! Don’t worry I will give you all the credit! You have saved me so much time! Boy that Steve is so smart!! 😉 I love this idea, Edie! I use my iCal for SO much already that this is an easy thing to incorporate for me. Not sure if you saw my comment on your previous post… I am going to swipe my son’s PC laptop and see if that will help me be able to subscribe to your emails! Can you email me your most recent newsletter? That would be GREAT! Thanks! And thanks for the great tutorial. PS: We love your “glitter-lined” brain. haha Looking forward to meeting you at BlissDom! I know that someone has already requested for you to make all your meals available once you have them complete. I am here to second that! Please, please give us recipes and meal plans! I have two little ones and a husband dropping in and out (military) so I could really use a plan where I don’t have to think about what to cook! I’m off to add a calendar for my home maintenence/cleaning. Thanks for the inspiration! Catching up. I was just telling my daughter I don’t know how to use the calendar on my computer. You’ve solved that! Thanks. I just set up my calendar and I’m so excited! This could not have come at a better time for me. Meal planning was one of the goals I had set for myself this year. I have tried various ways to plan our meals in the past and nothing was ever just the right fit…until now! Thank you, Edie! How did you change your font colors? I can change the background color but not the font! I have soooo been wanting something like this tutorial!! You’re the best. I just finished part time remote work for my last company and had to return my work iPhone. Am awaiting investing in my own personal one, but in the meantime this google calendar is where I am going to get started. I have a paper calendar on the table next to me with notes all over…need to reread your post to see if you have ONLY ONE CALENDAR system…or do you still have a paper one as a crutch? I’m old….. I just bought a separate calendar to put my recipes in with the same purpose in mind of repeating menus after so many weeks. You are one step ahead of me. I can still be old school and print all of my recipes, but this would help with all of my paper clutter and overflowing files of recipes. Thanks for sharing. I will definitely share your link with others. Maybe in a few months I’ll tackle google calendar. Edie, I love this… But I love paper more. Weird, I know… I love a new paper calendar and a freshley sharpened pencil or a fine point pen. I wish my brain would function like this. It would probably allow my home and meal times to run smoother, but I love paper. Pretty paper, little note papers, journals, calendars, notecards, pretty envelopes, PAPER. Same with books. I need them to be real and in my hands as paper and to add to the craze, I do not like book covers, I just want the pretty hard book to show, as plain as it may be. Love your blog, your recipes, your ideas, and your kind spirit and use of “big” words that force me to pull out the dictionary on occasion. Have a blessed week! You are lovely. I fully agree and thank you for saying that finding enjoyment in cooking takes time. Praise the Lord I am finding the enjoyment in it, and now with a tutorial I can understand, this homeschooking mama may actually may get the dinner time thing off the ground! Can’t thank you enough for posting such an awesome resource! I have an eight month old and am fairly new to the stay-at-home mom world, so I’m a little unsure as to the best ways to make the most of my time and our resources. I have a feeling this will make things easier on our family for years to come! Oh. My. Gosh. Why has this never occurred to me? I think I can follow your lead and set this up on iCal and, with iCloud, have the calendar readily available across devices, i.e., iMac, iPad and iPhone! Thank you for opening my eyes! You keep helping my life 🙂 Here is a hug! I have been dreaming of doing this for two years and I finally sat down and followed you step by step. I had already had a list of the recipes I wanted to rotate so it was easy peasy. Thank you so much for posting this! I am finally sitting down to create my meal calendar b/c, I too, get crazed about dinner mostly because of a lack of planning on my part. I’m always asking my husband for suggestions and I always ask him what his favorites are and he never seems to remember any, so hopefully this will help us both find ideas and remember meals that we like. I love finding new recipes to try but its always hard to remember all of them and remember which ones were good, so I think this is key to ending the crazed weekly madness!! Thank you, thank you! I think the linked calendar is key to all of this! THANK YOU! I set this up last week! Fab-u-lous!! I just followed your tutorial to set up may calendar and synced them perfectly! Menu is tomorrow’s job…thanks ever so much! So smart! I have been using Google Calendar to plan my menus, but I am always running out of ideas and don’t know what to fix for the coming week. I love the repeat idea! I can use it on our favorites and make sure we eat them more often. Thank you! I came up with a twist … more often than not, I only use about one new recipe per week, so I’m using the notes section to type up my grocery list for that meal if I don’t need to put in a recipe. Instead of possibly forgetting an item, I have little pre-made grocery lists! I always make extra roasted chicken, so I think on the other weeks we have it, I’ll alternate leftover ideas – chicken fried rice; pasta with chicken, parmesan, and roasted vegetables; etc. I LOVE this idea. It’s absolutely brilliant! I so struggle with meal planning and remembering options. This will help so much. Thank you! a regular TV, and often times we do not know what makes a good plasma TV. a broad knowledge about technological terms. Let your kid know what whining sounds like by doing an imitation. This is pure genius. I usually shop on Sundays, so I may just create a recurring list of 5-6 meals in one calendar entry on Sundays and have that entire week repeat. Love this! I was totally skeptical and it TOTALLY worked! LOL Thanks. Can’t wait to use this. I found your blog not too long ago and have admired you and it ever since! I have a patient husband who suggests often that I get more acquainted with my Google calendar. This blog post actually got me excited about it! The meals, the chores, everything!